Learning how to start a blog is one of the best thing I have ever done! When I launched my blog a year and a half ago, I knew I wanted to be able to create a profitable blog, but wasn't sure how to actually do that. Please note, this blog post was updated January 9th, 2019. It took some trial and error, and I'm happy to report that I've eighteen months later, I am still blogging. First, grab this free guide on 7 Ways to Boost Your Blog Income Overnight to increase your income this year! If you want to launch a profitable blog and start making money, scroll all the way to the bottom of the post. If you want to read my month-by-month journey of how I increased my blog income from $60 to $9,600, keep reading! A lot has happened in the past eighteen months. I went from being a part time blogger to full time blogger. I quit my day job and now earn a full time living from blogging. I started providing Pinterest freelance services when I saw a gap in this industry. I even have two courses – one on side hustling and one on Pinterest – that I teach and talk about in live workshops! I also provide Pinterest pin templates for bloggers and businesses that struggle to create Pinterest pins. While this feels like I have accomplished a lot, it did not happen overnight! Everything that has happened was a natural progression and happened very organically, although I always had goals in mind. So many people are interested in starting a blog and making money and it can be done! I am a perfect example of someone who's hard work is paying off! 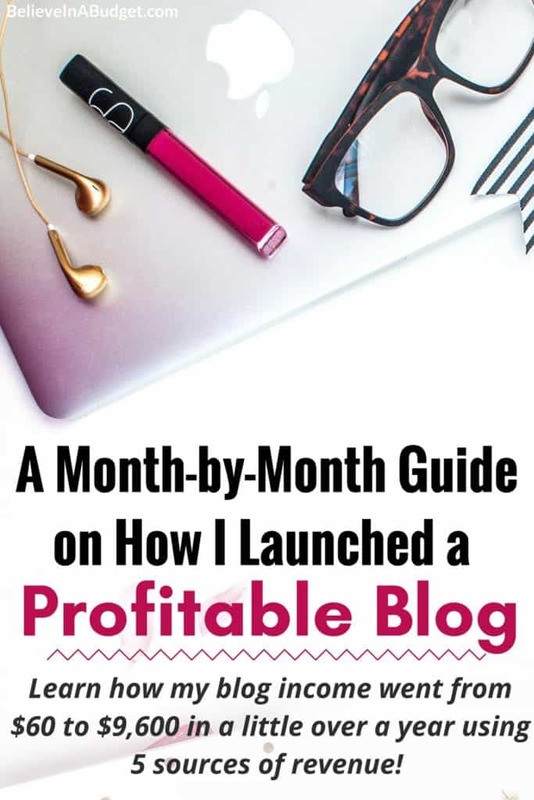 I want to share the steps I took to launch a profitable blog and how you can too. I have created a chart to show you the overview and progression of my blog. In simple terms, here's what everything looks like on paper. These numbers don't tell the whole story though. It's so much more intense and complicated than this! Here is a chart in reference to my blog income month per month for the past sixteen months. My blog is about twenty months old, and I didn't make any blog income the first four months of blogging. The first four months of blogging were spent on writing content, finding my writing style, establishing and maintaining a blogging pattern, etc. Monetizing was in the back of my mind, but not something I was focused on from day one. It's still really weird to be able to look back this far and see my progress. Somedays I feel like a brand new blogger because there is still so many things I can improve on and get better at. Other days I feel like I've been blogging forever and feel confident in certain areas, like Pinterest! This is also the first time I've listed out my blog income and how it correlates to different sources of revenue. On paper (or typed I suppose), it looks like my income increases everywhere there is an asterisk. This is true, but not true. While it looks like almost every month's income increased due to a new source of income, this wasn't always the case. Sometimes other revenue sourced dipped and the new income source was just that – new. For example, one month my income from brands/sponsorships might have increased my overall blog income, but my ad income might have decreased. Every month, every income amount from all my revenue sources is different. No two months are ever the same! In the early stages of blogging, I knew nothing about how to even have a profitable blog, I just knew I wanted one, ha! I was really confused and a bit all over the place. As I mentioned above, the first four months of blogging, I didn't try to monetize my blog. Honestly, it wasn't important. I knew that I needed to have amazing content first, write consistently and establish myself as a reliable blogger. While my strategy has totally changed now, I wrote three blog posts a week (which I kept up for an entire year!) I focused on sticking to a schedule, treating my blog like a business and absorbed and learned as much as possible. Over time, I've realized that the more sources of revenue I have, the better chance I have to increase my income or at least keep it consistent. If you are a freelancer, it's possible your client might want to end your services and you are out of a job. If you are an affiliate for a popular program, what would you do if the affiliate program was discontinued? These are just a couple things you need to watch out for. When I first started monetizing my website, I started with one source of revenue. My income was low and it was hit or miss when it came to making money. Today I rely on five sources of revenue. By having multiple income streams, I have a better chance to earn income consistently. If one source of income decreases, my other sources of income are generally fine, so I don't have to worry too much about taking a hard hit. This creates less stress for me! 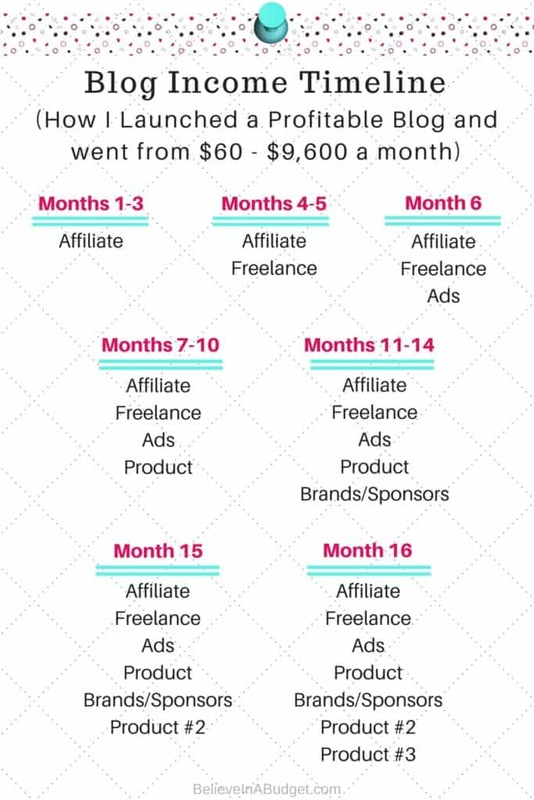 In my first few months of blogging, I started trying to use affiliate income. I didn't really understand how it all worked or how to use it properly on my blog. I decided to add in a few products to my site. I really want to emphasize that I only had three affiliate products I was promoting. They were all products related to my website that I was using, like my blog theme and a book I was reading about blogging. Of course, looking back, this was a good start but I didn't really use affiliates properly. I mentioned the products in a couple sentences here and there on a few different blog posts. Somehow, I managed to get some sales during this time. Affiliate income was my sole source of blog income during this time. During this time, I started sharing blog posts on how Pinterest was helping my blog get more traffic. Generally I was sticking to personal finance blog posts, but decided to venture out past my comfort zone and write about Pinterest. I wrote a blog post about how my traffic went from 5,000 to 17,000 page views in one month and the post received a lot of social media shares and traffic! Fellow bloggers reached out to me and ask for assistance in helping them with their Pinterest accounts. Not sure what to do, I debated this new opportunity. On one hand, potential clients are wanting to pay me to help them. What an amazing opportunity! On the other hand, I had never really thought about freelancing as a source of income. I decided to take advantage of the opportunities being presented to me and go for it! After all, I'm all about the side hustles and this seemed like a pretty good side hustle. I decide to work with a handful of clients and became a Pinterest Manager! I added a Hire Me / Work With Me page on my blog. This page lets potential customers learn about my services that I offer with sample pricing. Over the next couple months, I continued to receive interest from potential clients wanting my help. My blog income during this period now comes from affiliate income and freelance income. Finally, after months of waiting, I received my first check from Google Adsense. Praise the Lord!! By far, this was the hardest $100 paycheck I've ever had to work for. This is why you should not rely on ad income in the early stages of blogging. By this time, I've added Media as an additional source of revenue for ads. Now I have multiple ad companies I'm using on my website to see which ad company is working best for me. I'm all about the options! My freelance income also starts to increase as I started pricing my services at a higher rate due to the demand. This was a surprise area of income for me! I'm really grateful I said yes to the opportunities I was given, as it's really increased my income. Having additional income in addition to my full time job is amazing. My blog income now comes from three sources: affiliate income, freelance income and ad income. 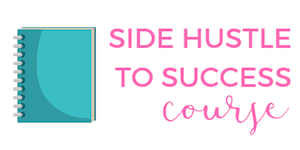 I released my first product, an ebook on how to side hustle. I started promoting this book on my website, as well as asked a handful of fellow bloggers to become affiliates and promote my book too. On a side note, this time frame was around the end of the year, mostly fourth quarter and into the new year. My page views were crazy high due to my Pinterest strategy and a number of my clients were demanding, with everyone trying to get things done before the holidays. It was the busiest part of the year for me and the busiest period in general. My blog income now comes from four sources: affiliate income, freelance income, ad income and product income. These were crucial months for me. So much happened during this time, it was overwhelming, but in a good way. I ventured into new territory by reaching out to brands. For some reason, I had a personal goal of waiting to get 100,000 page views consistently before thinking my blog was “good enough” to work with brands. Total mistake waiting to do this. I fell into some kind of hype and read too many poorly informed blog posts that convinced me I couldn't get a brand to work with me until I had certain numbers. Why did I do this? So, so dumb. This is so not true! Looking back, I should have started reaching out to brands at a much, much lower number and just asked for less compensation and different terms. Either way, brands jump to work with me and this becomes a new, fun source of income for me! While I enjoyed working with brands, I turn down about 90% of the offers I receive. I find this ironic. In the early stages of blogging, I dreamed of working with brands and thought it would be an easy way to earn income. Instead, my blog is now like my baby, and I want to protect it at all times. Every decision I make is based on if my readers will find the brand helpful and worry I'll look like a sellout. Luckily, this has not been the case at all! I've limited the amount of brands I've worked with and every brand has been a perfect fit. By now, I've also been accepted into a private ad company. I stop using Google Adsense, Media and Numus and use AdThrive for all my ads on my website. My ad income essentially doubles overnight without my blog doing anything different. By being in a private ad income, I'm exposed to better paying ads than I was with Adsense and the like. Mind blown my ad income can increase so much without doing anything differently to my blog. I'm exhausted. By now I have a VA that is helping me manage all my Pinterest work. It's become a lot of work! I have too many clients and couldn't keep up with new client requests. I realized that something needed to change. This leads me to brainstorming and creating my first course called Pinterest Presence. My blog income now comes from five sources: affiliate income, freelance income, ad income, product income and sponsors/brands. 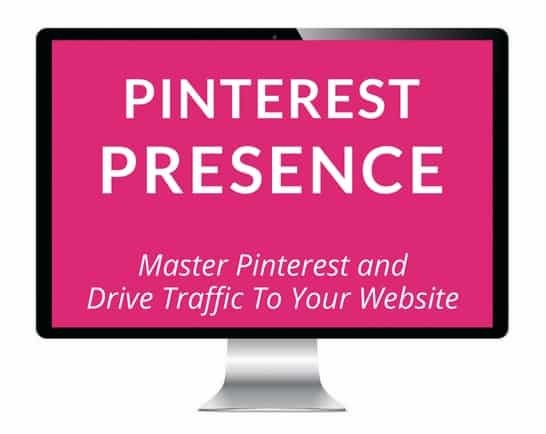 During this time I started receiving income from the Pinterest Presence course I launched in month 13. If you're wondering why it's not included in the previous months, it's because it took a couple months before I received any income for it. My course is called Pinterest Presence. 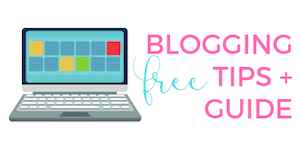 It's geared towards helping bloggers and businesses crush it on Pinterest and learn how to drive traffic back to their blogs and websites. The course was created because I was feeling stretched with freelance work and overwhelmed. I'd been turning down potential new clients on a weekly basis for the past couple months and had even took down my Hire Me / Work With Me page, but people still found me or were referred to me. The course immediately takes off the pressure I've been feeling about not being able to help every potential client or reader that had emailed me. Now I could direct them to a course that included my exact strategy I used for my blog and my clients' websites. My blog income comes from five sources: affiliate income, freelance income, ad income, product income (two products!) and sponsors/brands. Everything is steady and had been for the past three or four months. My income goes through phases. I feel like I stay around the same amount for a few months and then something happens, and it bumps up a nice chunk. Then it stays the same for a few months, and then bumps up again. I introduced my third product, which was a surprise and not something I had really thought about earlier on. Listening to what my readers want and trying to help everyone, I find that I'm getting a lot of requests on how to create a Pinterest pin. I put a lot of thought into how I can help everyone on such a custom product. Everyone has the same needs, which is to create a Pinterest pin that readers will want to click on. The problem was how can I create a product that can be automated that will require little work for me in the long run? Finally, I realize the solution is to create a bunch of Pinterest pin templates that have all the basics, but clients can customize on their end. Basically, I provide the layout, bones and structure and all a client has to do is make a couple small changes. Perfect! Click here to learn more about you can make Pinterest pins in seconds. In a very short time frame, I created and started offering this product. While the product itself is under $25, it started bringing in new daily income that I hadn't planned on! 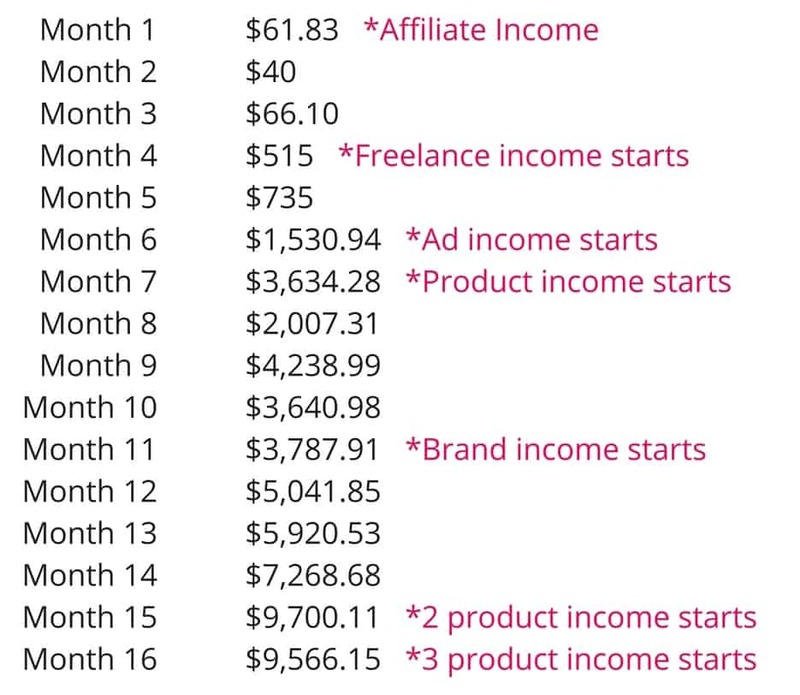 My blog income comes from five sources: affiliate income, freelance income, ad income, product income (three products!) and sponsors/brands. I still consider my blogging journey to be in the early stages. My blog is under two years old and I have so much more I want to accomplish. I'm extremely motivated (ok, I slack off sometimes, ha!) and get super pumped every day thinking about all the possibilities with where my blog can go in the future! I just think it's amazing I took my idea about wanting to start a blog and turned it into a full time career with no experience needed. Whenever I receive emails from readers wanting to start a blog, I get so excited because I want everyone to go for it! If I can do it, anyone can! If you have been on the fence about blogging, or want to start a blog but aren't sure what to really do, I'm hoping my month-to-month journey has inspired you to go for it. Here's a few steps to get started! Start your dream blog here! Use the resources page to learn about blog themes, ad companies and other suggestions to help you get started! Create an email and newsletter provider – Mailchimp is free, but ConvertKit is one of the best paid options available! Sign up for my newsletter below so you don't miss out on behind the scenes emails about blogging and side hustling! What is holding you back from starting a blog? If you have a blog, what are your goals? This was awesome! I’ve been spending the evening reading several of your posts about starting a blog. One day I am going to start one!!! Hopefully soon!! Had a question how did you learn how to become a Pinterest Manager? Great post Kristin, thank you for sharing your journey. Thanks for breaking down your income and sharing the first 4 months of zero revenue. I’m in month 2 and it’s a bit overwhelming so seeing your journey and now feeling like it’s more “normal” to be where I’m at is so helpful! P.S. 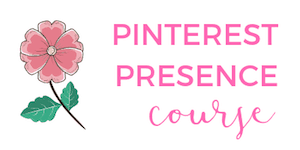 I LOVE your Pinterest VA course and am now going through your Pinterest Presence course. Thanks for your thorough, helpful teaching style. I’m confident I can use these skills for my own blog as well as with freelance clients. I appreciate you, thanks for your help and motivation!! Hey Selene, thanks! I think it’s really helpful to know that not very many people (if any) become rich overnight! But my fave thing about blogging is the possibilities of earning income are unlimited, which is just crazy awesome. So glad you like both courses, they are definitely going to help you crush it with your clients! I am so glad I came across this site. I’ve been blogging steady for about 3 months now and only average about 500 page views per month. I was starting to feel like everyone went from 0 to 5000 views overnight and 0 to $10,000 per month in a few weeks. Thanks for being honest about the process and willing to help others build their blog! I’m about to get busy reading, just wanted to tell you it was a relief to read an honest, itemized look at the process. Ha! It’s definitely been a slow and steady journey for me. I’m also pretty transparent, so while you can 100% CRUSH IT and blogging, it does take some time, so be patient! Ha! I was definitely not an overnight success. I think people forget that you have to treat it like any other job – it’s hard in the beginning because you are learning as you go, but the longer you stick with it and continue to learn, the better off you will be 🙂 GOOD LUCK! Hi Mary, thanks for reaching out! Do you need help with setting up your blog or what comes after you set up your blog? Wow. OMG…such good advice. Thank you for sharing your journey. I really need to get started.